Walking through your average health food store today, you will see the old food paradigm creeping back onto the shelves. Row and rows of cartoonish boxes and bottles with colourful labels that claim to be “health foods” abound, but are not really that different from the products found in mainstream supermarkets. One of the most concerning aspects of this trend is the emergence of “non-GMO” as a brand/meme that competes with “certified organic” in the minds of consumers. But once one understands the issue, there really is no choice at all. Eating organic is the only way to go if you care about your health and everything else that lives. When food is organic, it automatically means that it cannot be genetically modified, so why has the “non-GMO” label emerged at all? It sure seems like the non-GMO brand protects a whole lot of Monsanto’s agri- business. They get to keep selling chemical fertilizers, nerve-agent pesticides, fungicides, and devastating herbicides to the tune of billions of annual sales. Consumers have been duped into thinking that their non- GMO groceries somehow represent a progressive choice, as if they were organic-like. But as we shall see, there can be no compromises when it comes to eating organic. Monsanto’s Roundup® is a glyphosate-based herbicide (GBH) originally designed to clean boilers. In 1974, it was approved for use to kill weeds for agriculture. The World Health Organization’s Agency for Research on Cancer recently declared it to be “probably carcinogenic”, but the list of health problems associated with GBHs is far greater than just cancer. Dr. Stephanie Seneff, a research scientist at the Massachusetts Institute of Technology (MIT), reveals how glyphosate wrecks human health. According to Dr. Seneff, glyphosate is possibly "the most important factor in the development of multiple chronic diseases and conditions that have become prevalent in Westernized societies,” including but not limited to: autism, bowel diseases, obesity, allergies, cardiovascular disease, depression, infertility, Alzheimer’s, Parkinson’s, multiple sclerosis, and many more. Glyphosate does this by stripping your body of minerals (remember it began as a boiler cleaner), and causing systemic toxicity. It also disrupts intestinal flora, preferentially killing healthy bacteria (such as acidophilus) and allowing pathogens to overgrow. GBHs are used extensively on most farm fields, and are sprayed on virtually all GMO and non-GMO grains right before harvesting, making eliminating glyphosate the number one reason for eating organic. Cooking oils are one of the highest concentrations of glyphosate. ONLY ORGANIC FOOD IS GLYPHOSATE-FREE. JUST EATING “NON-GMO” DOESN’T CUT IT. Genetically-modified organisms represent one of the bigger ecological concerns of our era. But health food store products that say “non-GMO, all-natural” isolate only one aspect of being organic (and definitely NOT “all-natural”.) ORGANIC ALWAYS MEANS NON-GMO. So when you say organic, you are saying non-GMO. No need to say both. Healthy soil, healthy food, healthy world, healthy you. Non-organic crops often use varying amounts of chemical fertilizers. These chemicals imbalance the soil, and produce veggies that might look nice but lack the underlying minerals found in organic produce. Organic produce costs more to grow and purchase, but has a much higher nutritional value. Organic farms such as Moondance or Cookstown Greens have extensive soil enrichment procedures that provide full spectrums of minerals and trace elements to your food. Chew less, feed your body more: ORGANIC PRODUCE CAN HAVE UP TO 2-3 TIMES THE VITAMIN/MINERAL CONTENT. Pesticides used extensively on non-organic crops were originally designed as nerve agents and used as military weapons of war. Should we really accept this being on our food? Our tolerance level for nerve agents on our food should be absolute zero. EATING ORGANIC MEANS EATING PESTICIDE-FREE. What about the Dirty Dozen and the Clean Fifteen? These two lists focus only on pesticide levels on produce, and as such they are as incomplete as non-GMO. The idea with the Dirty Dozen and the Clean Fifteen list was to highlight products that have more or less pesticide residue (sometimes after pressure washing), in an attempt to help consumers make better choices as to which produce they should buy organic or never eat. On the surface this seems like a noble effort, but when you consider the fine print, not so much. the holistic perspective, which considers the “whole” instead of myopically focusing on just one part. When you choose ALL-ORGANIC, ALL THE TIME, without compromise, you are supporting a world where there there are no more disastrous mad science food adventures, perhaps causing irreversible harm to our eco-systems. There are many more reasons to choose an all-organic diet. Organic farms are much smaller, often family-based businesses. The higher prices for organic produce allow farmers to make a better living selling organic, despite smaller production volumes. Generational wisdom of organic farming practices can be enhanced and preserved, so that future populations will be able to receive and protect this knowledge. Who knows what the chemists and mad doctors will come up with next to mess with our healthy food supply for the sake of profits? What new thing will they spray on our food, where the negative impact is only felt a decade or more later? What is the long-term environmental impact? ALWAYS EAT AN ALL-ORGANIC DIET and you no longer have to worry about the answers to these questions. Glyphosate should be at the top of that list. Glyphosate, (aka Roundup from Monsanto) is a highly destructive chemical used most often in conventional farming practices. The use of Glyphosate is often lost in the umbrella of Monstanto's other warped farming practices namely genetic modification of plant species such as corn and soy. Although there are several reasons to Eat Organic, Glyphosate is a worthy reason all on its own to adhere to a strictly organic diet. As well, the clothes we wear, the cleaning products we use, and skin care/make up products all play a part in reducing exposure to harmful chemicals finding their way into our blood stream via skin, digestion, and air. The best way to minimize glyphosate exposure is to adhere strictly to a completely organic diet. In their formative, brilliant 2016 study, Anthony Samsel, PHD, and Stephanie Seneff, PHD, have discovered that glyphosate in Roundup has devastating effects in the human body. "Glyphosate alters and destroys collagen of the basement membrane and extracellular matrix which surrounds each cell. This leads to the destruction of every gland, organ and tissue." Our Patio is Open, Licensed and Beautiful! Come and join us for a coffee and dessert, a glass of organic chardonnay or organic/gluten-free beer on our warm sunny country patio! The patio is located just off the parking lot in front of the yoga studio. We can serve lunch or dinner Tuesday through Sunday! 2-Year Anniversary OPEN HOUSE Celebration! This past weekend we enjoyed the talents of many local musicians, healers, and health professionals as we shared our beautiful yoga-wellness centre and restaurant with over 80 members of our community! We served delicious samples (most of which were far more than samples!) that consisted of: vegan poutine, egyptian lentil soup, smoked mushroom sliders, vegan chilli, warm apple crisp, and juice samples. We also offered a selection of organic wines and kombucha from our elixir bar. This as a gift to you for sharing this past 2 years with us, and helping us to grow into a beautiful centre filled with conscious happy vibrations. We are thankful! Our fantastic staff (clockwise around) Kim and Susan, Henry, Kitty, Jessika, Annie, Desiree, and Brianna, Matthew, Kody, and Nicole. Also not pictured: Andrew, Tanya, Marie, Tammy, and Lisa! Thank you so much for all that you do. We are thankful. Our wonderful clients and friends! Thank you for joining us on our very special day! Did you know that we are much more than a restaurant!? Vidya's Veggie Gourmet Restaurant began in 2008 as a small yoga studio and wellness centre in Newmarket Ontario offer yoga classes, infrared sauna, and nutritional consultations. From there, Kim Vidya moved her studio to the south end of Barrie, on Bryne drive for 3 years, and then moved to our current location in Thornton Ontario in 2013. It was this location that inspired the restaurant and the overnight retreat centre that houses up to 12 people in dormitory style rooms. At the new location Vidya's restaurant and wellness centre offers a plethora of services, events, live musicians, seminars, overnight retreats, bed and breakfast, and so much more. 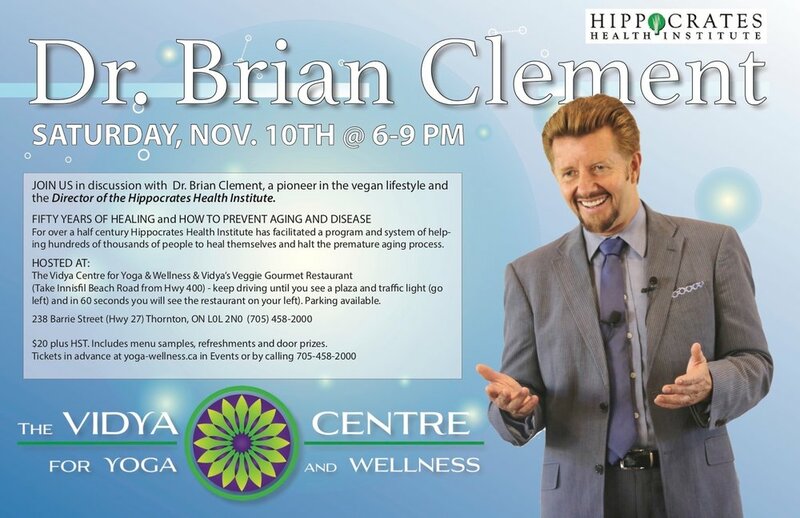 To learn more, visit: www.yoga-wellenss.ca and click on our EVENTS page for details on our exciting upcoming events! The Vidya Centre is seeking practitioners of all kinds to join our talented team. At present we are seeking a talented and friendly RMT to join our team! 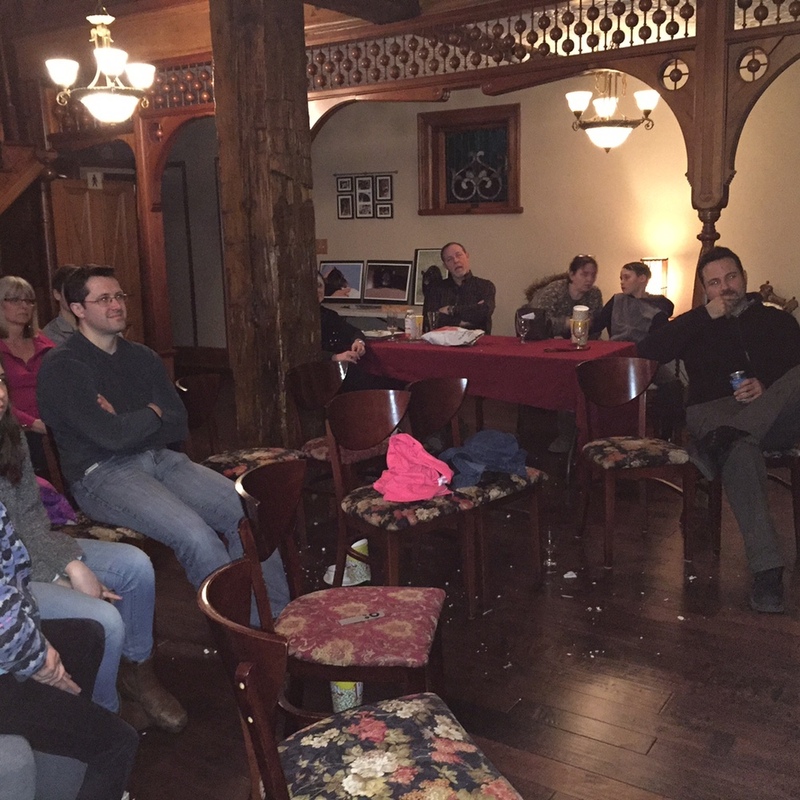 Nepal Fundraiser - A Tremendous Success! This past Friday, May 22nd close to 100 artists, musicians, and many compassionate members of our community rallied together for the people of Nepal, recently ravaged by earthquakes. Vidya's Veggie Gourmet is proud to have been a part of such an incredibly heart warming evening. Thank you to all who came out to share your light. To donate, please contact Vanessa at the link below. "OVERWHELMED with gratitude for an incredibly successful Nepal Relief Fundraiser event last night "Sangha helping Sangha", "Community helping Community". "Vidya's Veggie Gourmet restaurant was packed with love and support with friends from all of my life circles...And SOOO many friends who couldn't physically attend donated online or bought "virtual" tickets to support us. I am RIDICULOUSLY giddy to announce that we have raised $9534 so far! !.....We still have some items that didn't sell in the auction so I will post shortly with a "Second Chance" auction for those that couldn't attend and it's not too late to still donate online." "The biggest thank you, from my heart to all of my friends, near and far who contributed to this success. " VIDYA'S ONE YEAR ANNIVERSARY PARTY! THIS SATURDAY AT 9 PM TIL ?? COME DANCE, BEAT THE DRUMS OF PEACE, SHARE COMMUNITY, AND HAVE SOME EASY SMILES WITH STAFF, FAMILY, AND FRIENDS. EVERYONE WELCOME! TICKETS ARE $30 AT THE DOOR AND $20 IN ADVANCE (SEE LINK ON EVENTS PAGE). DRUM CIRCLE AT 9 PM. DJ MEDICINEMAN AT 10 PM. DJ BABAJI SARASWATI AFTER MIDNIGHT. Vidya's First Sunday Movie Night A Great Success! We are very excited to announce the grand opening of our 3rd floor bedrooms for special events, overnight retreats, and weekend bed and breakfast guests! When we are not running a yoga/wellness retreat our centre is open for you to spend the night or weekend. Come and enjoy the ambiance and charm of this ancient building, delicious food, yoga/pilates/nia classes, massage, infrared sauna, consultations, quaint old town, and exceptional service ....anytime! More pictures of our beautiful wellness retreat centre here. Please contact Kim Vidya for an estimate on your upcoming event, or to make a reservation. Northern Organics and Vidya's Veggie Gourmet are excited to have the opportunity to bring a national speakers’ tour on the topic of genetically engineered foods and the impact on your health to Barrie. Dr. Thierry Vrain, a retired soil biologist and genetic engineer who after a 30-year career with Agriculture Canada now speaks against GE technology, and Mr. Tony Mitra, podcaster, videographer, internationally active citizen journalist and food security activist. The goal of the evening is to talk about what we can do to increase the awareness about genetically engineered foods and how we can work together to get them off of our dinner table. This is an Invitation Only exclusive engagement and includes a delicious 3 course meal. Tickets are $50 per person and are on sale now and seating is limited!! Unable to attend, yet would like to help support this event? We are taking donations to help fund the speakers’ tour which they are donating their time to do. Donations can be made at the same link as above. Your support is greatly appreciated.